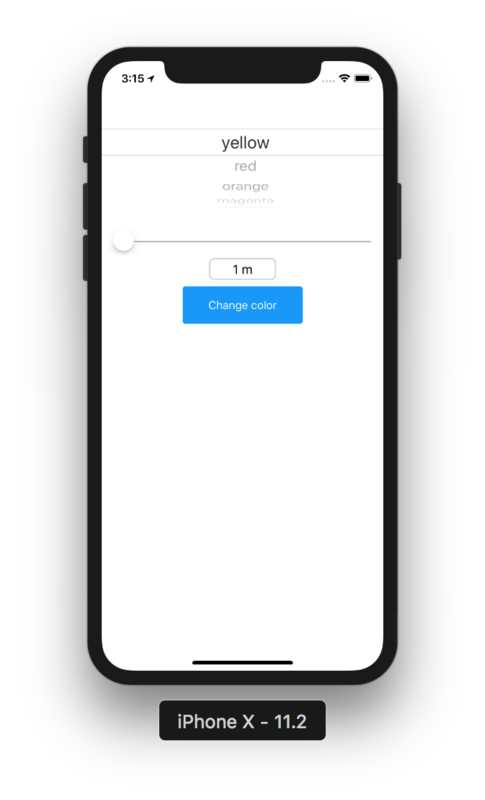 This tutorial will show you how to write an iOS app that changes the color of the screen of surrounding devices to match the most recent published value. We'll be working with Matchmore iOS SDK which encapsulates the well known CoreLocation framework. The code will be written in Swift 4 for iOS9 and Xcode 9.2. The purpose of this tutorial is to show you how quick and easy it is to get a proof-of-concept proximity detection based location app. Here is a link to a video to show how the app will work and look like when you are done. 1. Build the User Interface (UI) needed for this project (this post). 2. Integrate Matchmore to create geomatching and put color on the screen of surrounding devices. 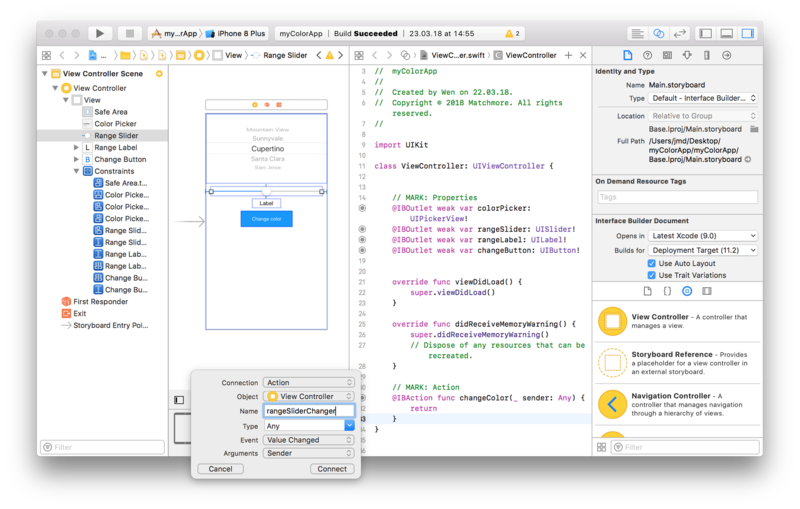 Xcode 9.2 or newer, so you can follow along with the Swift code. You'll need Cocoapods installed to pull Matchmore into the project. A Matchmore account to start the service. You can register for free here. If you want to test the app in real life, you'll need at least two iPhones supporting iOS9. Else, you can test it via Xcode simulator. 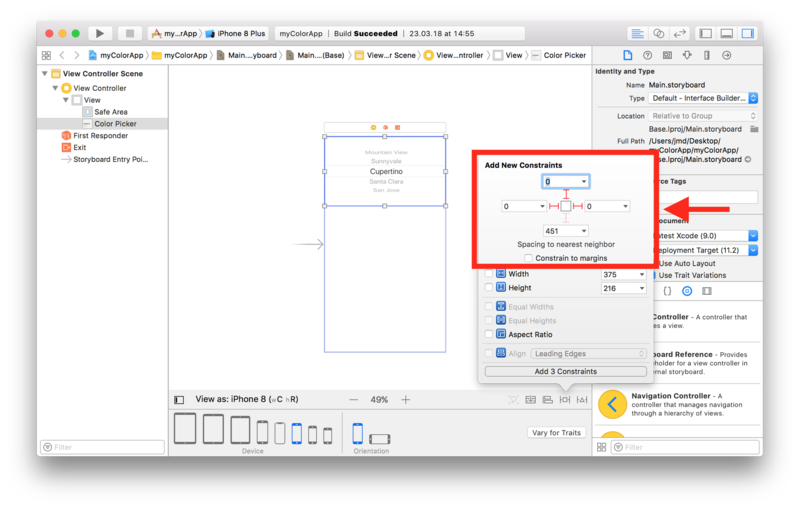 In this first part, you'll create the single view needed for this app. This is relatively basic stuff, so if you are an advanced developer you might want to jump directly to the second blog post about Matchmore and geomatching. Here is a link to download a ready-to-use UI, the project is explained in the fellowing tutorial. To get started, create a new project and choose the Single View Application template. On the project option's screen, make sure you choose Swift as the language. Open your storyboard, in the project navigator, select Main.storyboard. In the Object library, type picker view in the filter field to find the Picker View object quickly. Drag a Picker View object from the Object library to your scene. Picker View will allow the user to pick the color of his surroundings devices screen. Drag the picker view so that it’s positioned in the top of the scene. On the bottom right of the canvas, open the Add New Constraints menu. Above Spacing to nearest neighbour click the two horizontal constraints and the top vertical constraint to select them. They become red when they are selected. Type 0 in the top, left and right boxes. Press Return. In the Object library, type label in the filter field to find the Label object quickly. Drag a Label object from the Object library to your scene. Drag the label so that it’s right under the slider and aligned with the left margin in the scene. Stop dragging the label when it snaps to the guidelines. Resize the left and right edges of the label until you see three vertical layout guides: the left margin alignment, the horizontal center alignment, and the right margin alignment. While the label is selected, go in the Attributes inspector, find the field labeled Alignment and click on the centered icon. On the bottom right of the canvas, open the Add New Constraints menu again. Above Spacing to nearest neighbour click the top vertical constraint to select it. It becomes red when it is selected. Type 8 in the top box, set constraints Width equals to 90 and Height equals to 30, press return. On the bottom right of the canvas next to Add New Constraints menu, open the Align menu. Tick the Horizontally in Container, and press return. In the Object library, type button in the filter field to find the Button object quickly. Drag a Button object from the Object library to your scene. Drag the button so that it’s right below the label. Stop dragging the button when it snaps to the guidelines. With the button selected, open the Attributes inspector in the utility area. In the Attributes inspector, find the field labeled Text Color and change it to White Color. Stay in the Attributes inspector, under View, find the field labeled Background and change the color to HEX Color #0096FD. Double-click on the button and type Change color. Press Return to display the new text in the button. If needed, drag the button so that it’s right below the label. Type 8 in the top box, set constraints Width equals to 160 and Height equals to 50, press return. Your UI is ready and should look like image below. Now you’ll connect the basic user interface (UI) to code and define some actions a user can perform in that UI. Click on the Assistant button in the Xcode toolbar near the top right corner of Xcode to open the assistant editor. 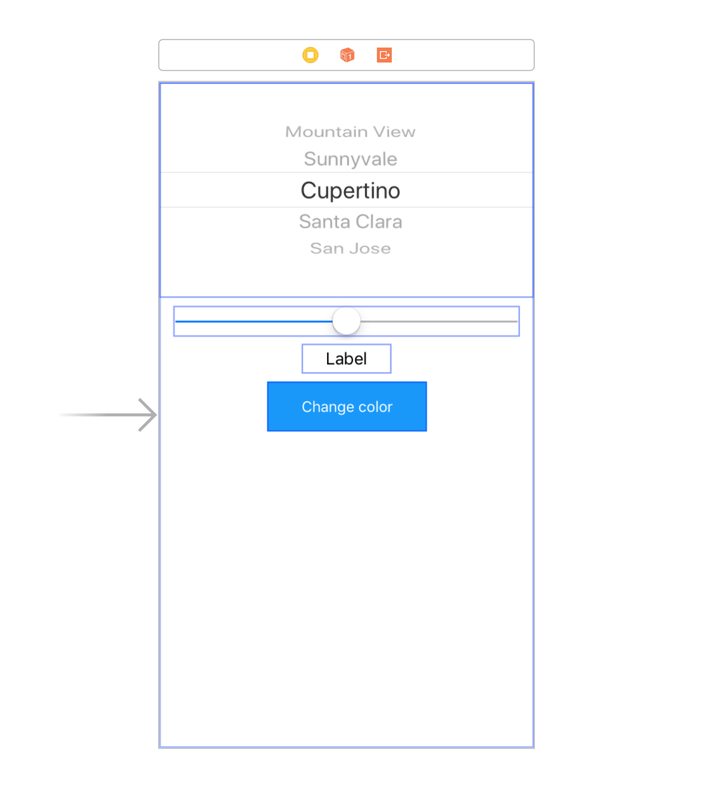 In your storyboard, select the picker view. Control-drag from the picker view on your canvas to the code display in the editor on the right. Stop the drag at the line below the comment you just added in ViewController.swift. In the dialog that appears, for Name, type colorPicker. Leave the rest of the options as they are. Click Connect. In your storyboard, select the slider. Control-drag from the slider on your canvas to the code display in the editor on the right, stopping the drag at the line just below your colorPicker property in ViewController.swift. In the dialog that appears, for Name, type rangeSlider. Leave the rest of the options as they are. Click Connect. In your storyboard, select the label. Control-drag from the label on your canvas to the code display in the editor on the right. Stop the drag at the line just below your rangeSlider property in ViewController.swift. In the dialog that appears, for Name, type rangeLabel. Leave the rest of the options as they are. Click Connect. In your storyboard, select the button. Control-drag from the button on your canvas to the code display in the editor on the right. 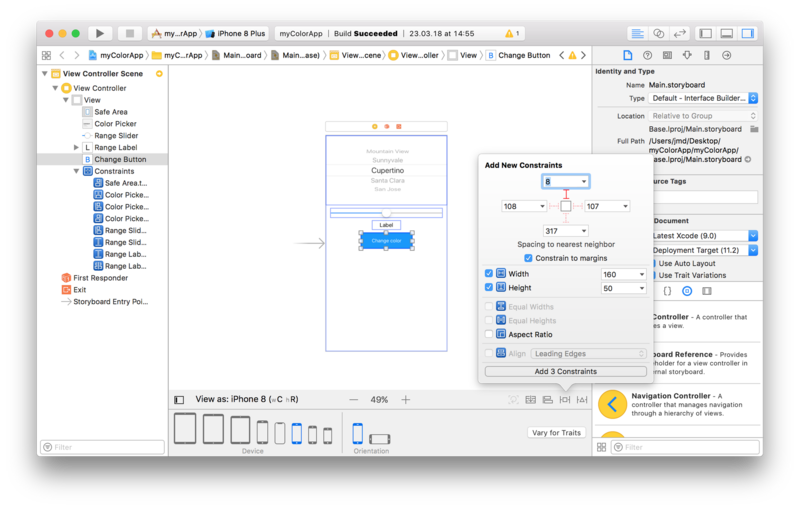 Stop the dragging at the line just below your rangeLabel property in ViewController.swift. In the dialog that appears, for Name, type changeButton. Leave the rest of the options as they are. Click Connect. In your storyboard, select the Change Color button. Control-drag from the Change Color button on your canvas to the code display in the editor on the right. Stop the dragging at the line below the comment you just added in ViewController.swift. In the dialog that appears, for Connection select Action. For Name, type changeColor. Click Connect. In your storyboard, select the rangeSlider slider. 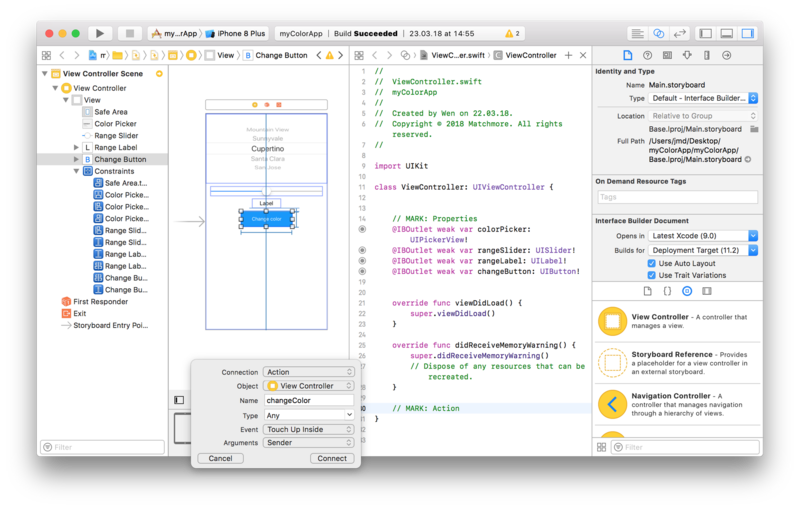 Control-drag from the rangeSlider slider on your canvas to the code display in the editor on the right, stopping the drag at the line just below your changeColor action just added in ViewController.swift. For Name, type rangeSliderChanged. Click Connect. Leave both actions empty for now. Let’s create the data that we’re going display in the Picker control. This new Array variable will store the list of data. Now that the Array is iniatialized, let's store some value in it. Make this class conform to the UIPickerViewDelegate and UIPickerViewDataSource protocols. You are now done with the UI (See image below) and we can now move on to implement the color feature based on geomatching. @IBOutlet weak var colorPicker: UIPickerView! @IBOutlet weak var rangeSlider: UISlider! @IBOutlet weak var rangeLabel: UILabel! @IBOutlet weak var changeButton: UIButton! Make sure it corresponds, else you can download the completed part one. If you wish to continue with this tutorial, click here to do directly to part 2. I hope you enjoyed reading this tutorial and wish you good luck! Make sure to not miss the second part. We will cover the integration of Matchmore, to make the app able to spread color to near detected devices screen! Here is the second (and last) part of the blog series on Getting Started with Matchmore. 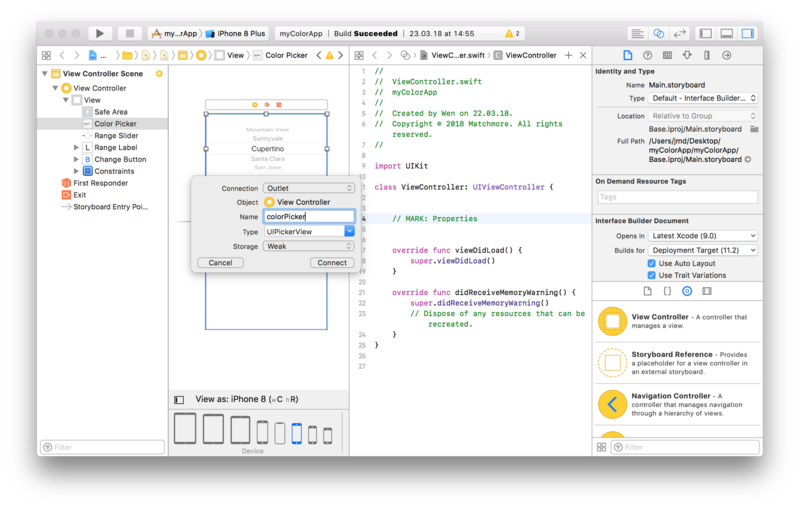 This tutorial will show you how to write an iOS app that changes the color of the screen of surrounding devices to match the most recent published value. Enjoy your geomatching! There are a lot of tech conferences organized each year around the world. In this post, Sofia Björklöv will outline which tech conferences Matchmore will attend in the month of April.